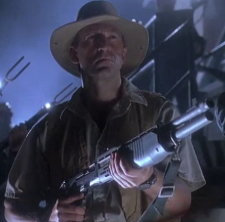 Jurassic Park’s game warden, Robert Muldoon was from Kenya and had been a long-time employee of John Hammond working at Hammond’s animal park in his homeland. A very cautious and levelheaded man, Muldoon was of the opinion that the park’s Velociraptors were too dangerous to be kept and should be destroyed. He especially felt this way after a terrible incident in which an innocent worker, Jophery, was killed despite Muldoon’s best efforts to save him. When the power went out, Muldoon took a gas-powered jeep at Hammond’s request and, along with Dr. Ellie Sattler, went looking for their stranded friends. They found one tour car abandoned, the other crumpled at the base of a tree, and a badly wounded Dr. Ian Malcolm. 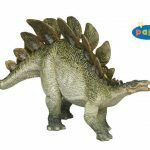 The Tyrannosaur appeared, but Muldoon was able to outrun it in the jeep getting himself, Ian and Ellie to safety. Later, when Ellie went to the generator shed to get the power back on, Muldoon went with her. He retrieved and loaded a Franchi Spas-12, a weapon he also wielded during the Raptor incident, from the armory in the Emergency Bunker and headed out. They discovered that when Ray Arnold had done an emergency shutdown to reboot, it had turned off the fence around the Velociraptors’ pen, allowing them to escape. Muldoon covered Ellie’s flight to the shed, and then took it upon himself to hunt the alpha female Raptor. However, the hunter became the hunted, as Muldoon realized too late a second Raptor was beside him. After his famous last words of “Clever girl,” the Raptor pounced and killed him. 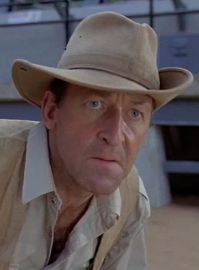 Robert Muldoon was played by the late Bob Peck (1945-1999).